In construction, the pipe making machines have a high productivity, reliable, versatile and are also fast and easy to operate. They are various types of pipe making machines in industry. The factors to consider when purchasing a pipe-making machine include durability, target through put, cost and efficiency considerations. Every customer needs to be judicious when purchasing a pipe-making machine to have a guaranteed return on investment. Quality pipe making machines are able to with stand huge volumes of concrete processing without experiencing major breakdowns. VIHY core vibrators guarantee the customer high compaction power and reduced cement consumption; this helps the machine to achieve good concrete densities. The VIHY table vibration ensures production of well compacted square as well as irregular shapes. The semi automatic operation having laser level fill control unit minimises the labour and increases the product consistency. 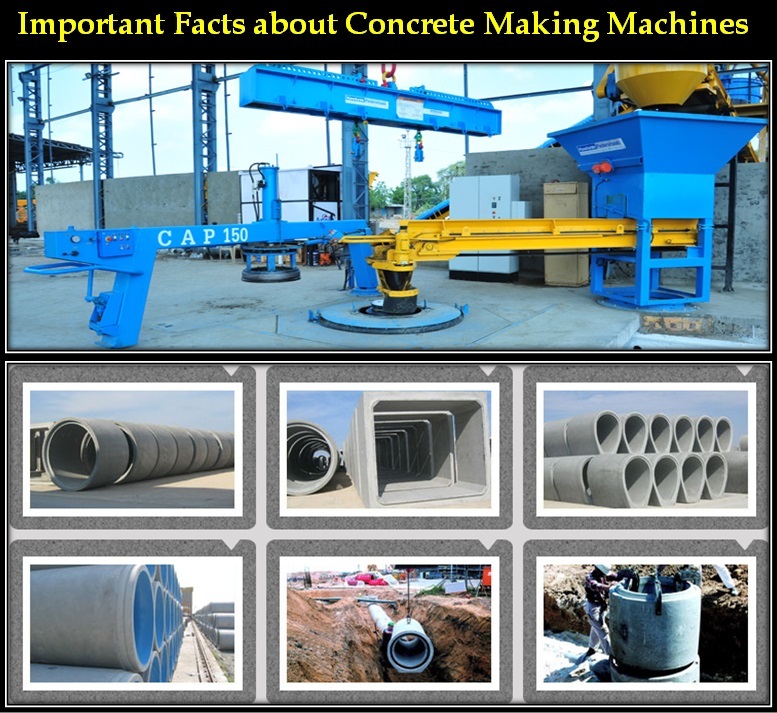 Some of the products made using the concrete pipe machines include the box culverts, complete man hole systems ,jacking pipes, cones, cover slabs and reinforced and non rein forced pipes. The pipes can have optional installation features, which help improve the efficiency, and effectiveness of the machine. These may include the automatic control units, pipe carts, and modems to link to the service departments. When looking for a good “cement pipe mould” manufacture, it is crucial to ascertain that the quality standards are strictly followed. There are various international standards that are followed during manufacturing. Most good manufacturing practices are aligned to the ISO 9001:2008 standards. It is important that the manufacturer ensure that the machine produces products that are strong in tension and compression, resistance to erosion as well as abrasion. The pipe machines are made into various lengths and outputs as per customer specifications. Training is also offered to the users on the operation procedures, servicing and maintenance as well as the recommended operating conditions. The quality and strength of a concrete product is highly dependent on the quality and design of the mould. The mould must be able to give quality product according to the use specification. It also determines the strength, durability as well as the dimensions of the product. The engineering tolerances for mould equipments are very stringent, while the internal surface finish must also be very high to comply with the international construction standards. Moulds must also not deform during manufacture of the concrete products, for consistency and accuracy to be maintained during production.